My family loves pasta. So much so that I prepare it approximately once a week for dinner. When I was growing up my mom always made a lot of pasta since it was inexpensive to make and could feed our entire family. She was great with inventing recipes from just spaghetti and the ingredients in our cupboards. I wish that I had inherited half of her recipe invention talents. While I don't invent recipes the same way that my mother did, I do like taking recipes and making them my own. Since I eat gluten free I am always taking regular pasta recipes and re-inventing them to my needs. This week I tried a new recipe for Rigatoni with Calabrese Style Pork Ragu from the February 2013 issue of Bon Appetit magazine. This recipe has 14 ingredients. It takes 5 hours of total time, 60 minutes of which is active and makes 6 servings. Since I eat gluten free I used brown rice flour ziti. I have never seen rigatoni gluten free in my area, so I always use what I have access to. Since I was serving this recipe to my kids I used mild Italian sausage, instead of spicy sausage. I would have used spicy sausage if it was just for my husband and I. I rarely buy ground meat from the grocery store. For this recipe I had leftover pork shoulder which I ground up and used. When I went to make this recipe it turned out that I had forgotten to buy fresh parsley so I had to substitute dried parsley instead. I followed the remainder of the recipe as written. Even though this recipe states that it makes only 6 servings, I had a ton of leftovers. There was enough for two additional meals. I did let my sauce thicken longer than the recipe. I had to add a slight amount of water during the four hour cooking time. However, at the end of the cooking time it was still a little thinner than I liked so I turned up the heat a little and let it cook without a lid until it had fully thickened. I also did not add additional cooking water after adding the pasta since it wasn't necessary. My family really loved this recipe. I would suggest adding a larger amount of crushed red pepper if you use mild sausage and make sure to adequately salt, it will need it. 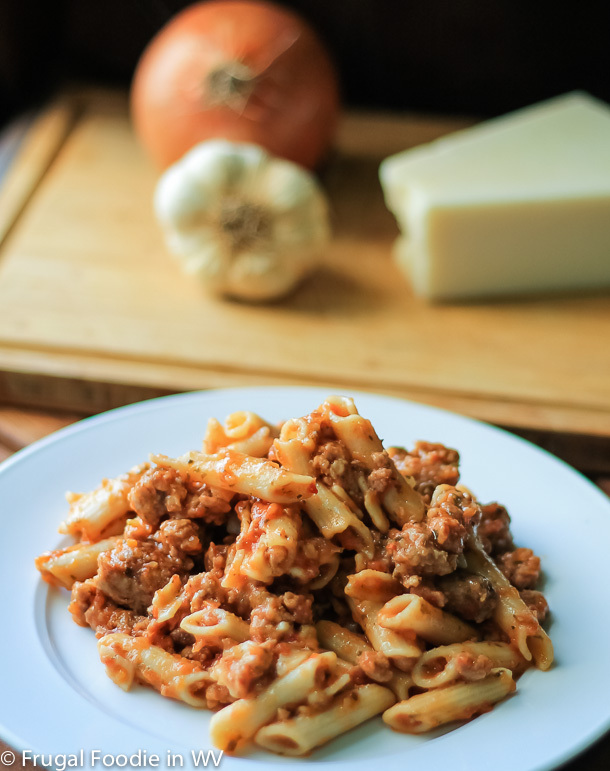 For the recipe go to Rigatoni with Spicy Calabrese Style Pork Ragu. I agree, pasta can be a great versatile ingredient! I love when a recipe a big enough that I have enough left over for a whole additional meal. I love leftovers too, it saves so much money! We love pasta here too! Yummy!